About the book: Life is tough, but so are you! 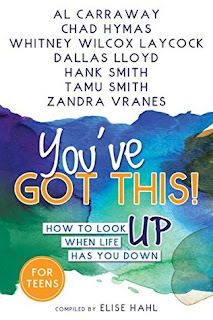 Learn how to work through life’s trials with advice from popular youth speakers, including Hank Smith and Al Carraway, who have endured a few challenges of their own. This encouraging book will help you see trials as essential stepping-stones to becoming who you’re destined to be. My review: This book is amazing! I loved each one of the chapters in this book. It's written for teenagers, so it's really a quick read, I read the whole thing in less than an afternoon, but it's packed with great advice and spiritual lessons that teens need in this crazy world! About the authors: After serving as a missionary to the Brazil Manaus mission, Elise Babbel Hahl completed her studies in English at Stanford University, married her mission pen pal, and went on to earn a master’s degree in writing from Johns Hopkins University. Her work has been published in Choosing Motherhood, Whereabouts: Stepping Out of Place, Education Next magazine, Do NOT Attempt in Heels, and recorded on “The World in Words” podcast. She lives with her husband and four children in the Pittsburgh, Pennsylvania area.